For the occasion, we hauled a locally raised Hudson Valley turkey (a Heritage Bronze from Northwind Farms in Tivoli, N.Y.; right) across state lines, along with herbs from our garden, bags of produce, my favorite roasting pan, a heavy-duty food processor, my beloved chef’s knife, and a mishmash of other cooking paraphernalia. My mother jokingly dubbed us the “Matthews Catering Service”. Given my late start (2pm) on Big Bird day and several flubs that had my husband racing to the store at the 11th hour for key ingredients—liked canned pumpkin—I couldn’t promise my mother that our meal would live up to her high expectations…. The menu? A crowd-pleaser. (See my previous post for some of the recipes.) Minimal fat. Lots of greens. No artificial fillers or fake foods. Just real food loaded with flavor. A balance of savory and sweet, bitter and spice. The turkey? The star! A locally raised, all-natural (no growth hormones, no antibiotics) 12-pound Heritage Bronze from Northwind Farms in Tivoli, N.Y. Simply seasoned with sea salt and freshly ground pepper. Flavored with with a garlicky, fresh herb rub under and over the skin. Tenderized with lemon juice and a few brushstrokes of grapeseed oil. I’ve never understood why Americans cook their turkey to death, then complain it’s dry and tasteless. Yes, it will be if you roast it for hours on end and cook it to 180 degrees (or more). If it’s for food safety reasons, consider buying a locally raised or hormone-free, antibiotic-free turkey. 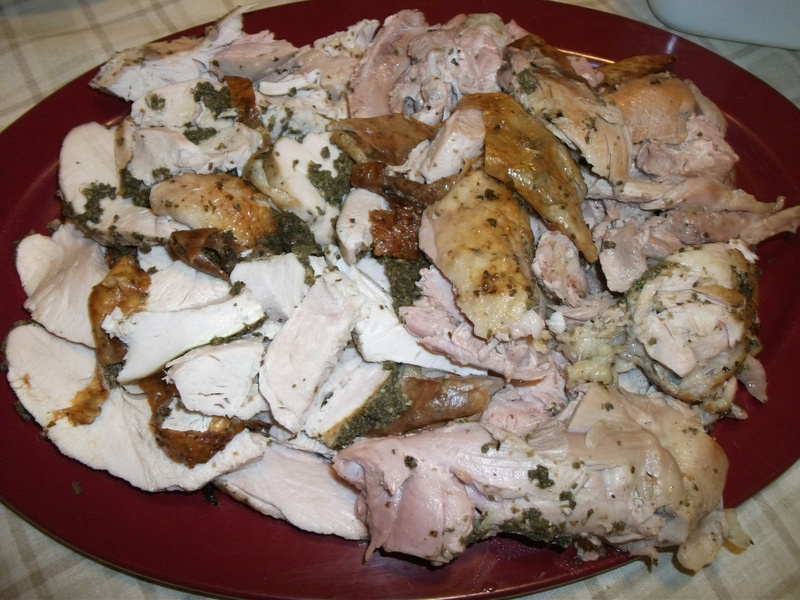 If you’re cooking your turkey “well done” to kill off any suggestion of gaminess….then, buy a chicken. Wild turkey or a healthy farm-raised, all-natural turkey will have a slightly gamey flavor. In any case, a tender bird is a worthy once-a-year splurge. To my punctual father’s consternation, I popped our turkey into the oven at 5:30pm. Our roasting time: 1 hour, 40 minutes (that’s 8 minutes per pound at 350 degrees). We aim for just north of 145 degrees. Our bird was perfectly cooked, juicy and tender—even the breast. The jus? Gravy not necessary. This turkey had little fat and so did the jus. We poured this intensely flavorful liquid out of the roasting pan and served it straight up. 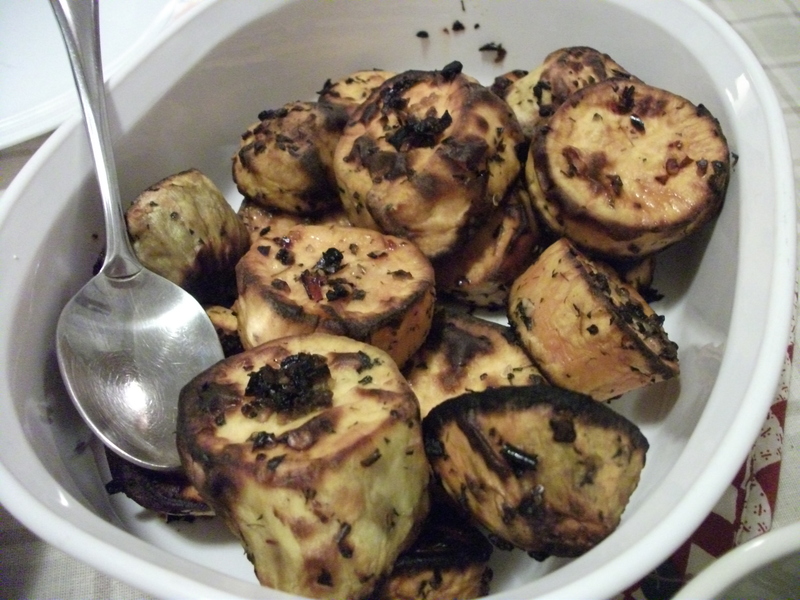 Thyme-roasted sweet potatoes. Always a hit. This time was no exception. Slightly crisped and caramelized on the outside, sweet and tender on the inside, with a hint of spicy bite (thanks to a generous sprinkle of red pepper flakes). Roasted Brussels sprouts with carrots and onion. Another classic at our Thanksgiving table. If you have bitter buds like us, you’ll find this deeply savory and satisfying. 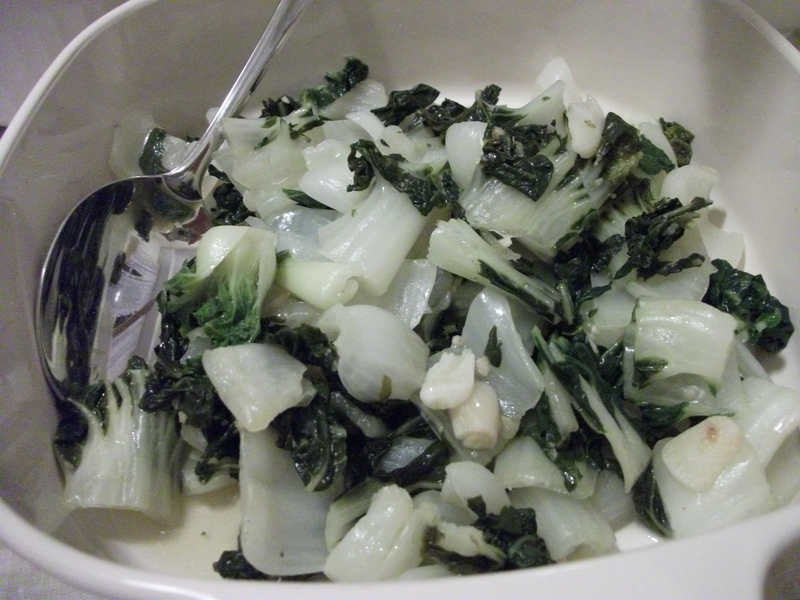 Sauteed baby bok choy. Half stir-fried and half steamed with loads of thinly sliced garlic. Fresh. Light. Delicious. Romaine salad with avocado and dried cranberries. Dressed in a balsamic-mustard-olive oil vinaigrette. A welcome palate cleanser. 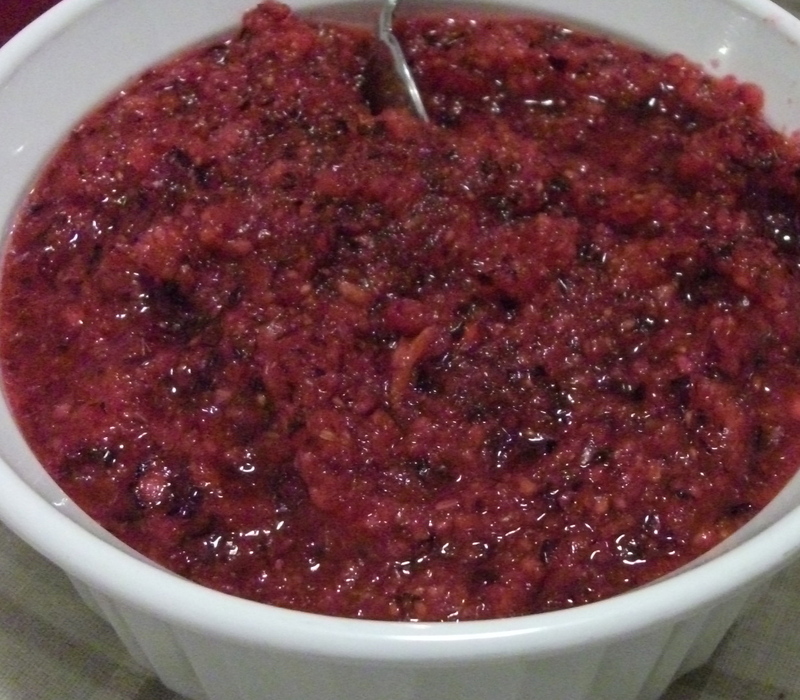 Cranberry relish: An untested recipe gamble. “You’re not cooking the cranberries?” my mother asked apprehensively, adding, “You know your father doesn’t like anything sour…” But naval oranges, stripped naked of peel, pith and skin, orange zest and creamy raw honey tamed the tartness of the raw cranberries. The relish was fresh and bright—even Dad liked it. Brown rice. C’mon we’re Chinese! There’s going to be rice at every meal…because it goes with everything. Whisky-ginger pumpkin pie. The reason I got behind schedule. I made this first and soon realized that I had forgotten several key (and hard-to-find) ingredients for an intended oatmeal pie crust—as well as the cans of organic pumpkin for my filling (still sitting in my pantry upstate). A hazard of long-distance “catering”. When my husband reminded me that we had no time for my obsessive perfectionism, I reluctantly shifted gears. I whipped up an all-natural butter pie crust in my food processor instead. After lining the dough in my favorite pie plate, I poured in the filling, only to discover—too late—that I had used too deep of a pie plate: the filling only came halfway up the crust! I grimly made another batch of filling—minus two eggs—folding it into the filling already in the pie crust. Into the oven it went, and I hoped for the best. Well over an hour later, the pumpkin pie that emerged from the oven was not a pretty sight. The filling, some of which had separated from the crust, was a spider web of deep fissures. “Pumpkin pie filling usually cracks,” my mother said kindly. Like the San Andreas fault line? Yeah, right. I swallowed my perfectionist pride and served up the whole gloppy orange mess—cracked filling, broken crust and all. To my delight, it was delicious. Everyone else thought so too. Just goes to show you…appearances can be deceiving—even a homely-looking pie can be a toothsome winner. The best part of the meal? Watching my family heap their plates, savor every bite…sans unpleasant post-meal side effects!! 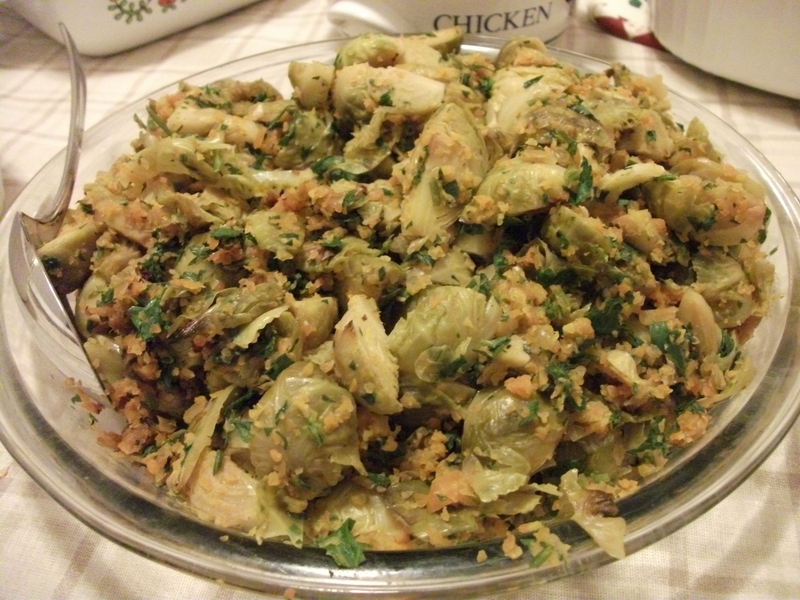 This entry was posted in Food, Health, Home Cooking, Hudson Valley Farms, Travel and tagged baby bok choy, Brussels sprouts, cranberry relish, Heritage Bronze turkey, Hudson Valley, pumpkin pie, sweet potatoes. Bookmark the permalink.